The Australian edition was further celebrated by the Guardian upon its launch as an effort to “cater [to] the 1.1million Australians who regularly read the Guardian’s global website”. However, it seems difficult to reconcile their mission, to cater to all Australians, with their failure thus far to devote any coverage to the otherwise widely reported racist incident two days ago in Sydney in which five Jews were viciously beaten – an attack characterized as “the worst incident of anti-Semitic violence” in the city in many years. In addition to reports of the incident in the mainstream media abroad, major Australian dailies have also given prominent coverage to the attack, which occurred after a mob of eight teens taunted the group of kippah-wearing Jews with racist abuse as they were walking home from Shabbat dinner. Four of the victims were reportedly hospitalized, with injuries that included a concussion and a fractured cheekbone. Two 17-year-olds and a 23-year-old were arrested at the scene, but the rest of the alleged attackers managed to escape. Of course, such selective reporting isn’t anything new at the Guardian. As we reported at the time, in 2012 the Guardian bent over backwards to avoid characterizing the murder, by a French-Algerian Islamist, of four Jews (including three children) at a school in Toulouse as antisemitic in nature, and even managed to publish two editorials on the attack without mentioning that the victims were Jewish. As we’ve argued previously, the stories the Guardian seriously downplays or even, as in the antisemitic attack in Sydney, avoids covering altogether, speaks volumes about their skewed, far-left ideology. 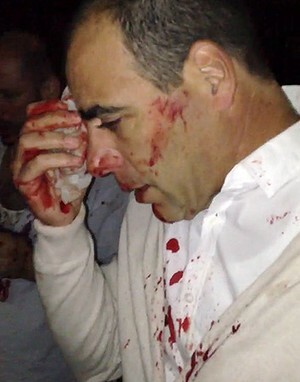 To be fair the French Police Chief in Toulouse specifically stated that right wingers were responsible . The article is trying to link the two and would have been stronger if it had not done this. I repeat though what a bunch of cowardly bs. From the cctv coverage of the attack, part of the coverage from the Australian newspaper ‘Daily Telegraph’, it was frenzied and violent. Which makes it all the more surprising that ‘The Guardian’ neglected or decided not to cover it. Sorry, but i couldn`t resist. Not remotely – `cause of his grandma`s father? Why bringing that up? There are alot of well known idiots, bigots, antizionists and antisemites of Jewish Background, so what? I apologize for the typos, but my keyboard is writing its own style, sometimes. The fact Jack Straw cited AIPAC as a reason to promote the Palestinian cause of, y’know, killing Jews with reason, is further proof that AIPAC had long ago reached buzzword peak of hate mongering dipshittery amongst debaters of the Middle East conflict. In other words, Jack Straw makes himself sound like David Duke, the KKKraziest KKKat of them all. You would expect this to be covered when a ministers is speaking against it. Though I wouldn’t take the suspect teenage arsonist’s arrest lightly i really believe there’s a place for the attack in a liberal paper! The omission is particularly revealing, because on 25th October, Cif published an article entitled “Why does the world think Australia is racist?”, about an Australian teenage girl who held a black-themed party. In Guardian-land, a violent racist attack against Jews is much less worthy of reporting than a tasteless party that offended some black people. There can be no doubt about the Guardian these days. It has become an intolerably anti-Jewish newspaper, and part of their policy is to minimize incidents of anti-semitism. 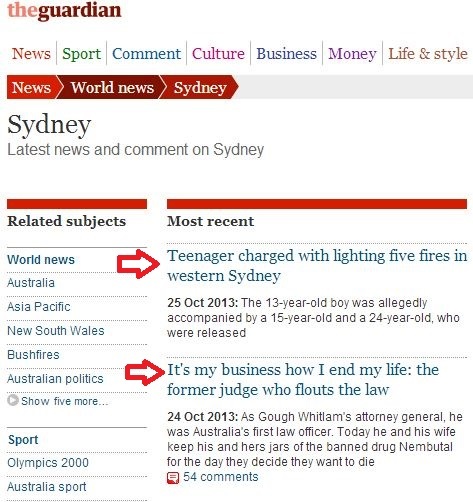 The Guardian has covered the attack in Australia in several reports. And while the G will not show how Aussie Jews are attacked unprovoked, maybe they will show how Jews safe guard Arabs from Syria while their own kill them. And at the same time I’d like to say well done to Sergent Maayan from Kibbutz Tzuba! God bless for saving lives, and being a great soldier as well in a dangerous area. This morning, the Guardian finally covered the incident. “Three Muslims arrested over anti Semitic attack in Bondi, Australia”. All posts referring to this fact, however circumspectly, are being instantly deleted by the Guardian. The Guardian is deliberately covering up Muslim racism in Australia just like they do in Palestine. It does not fit the ‘Muslim is always the victim’ myth the Guardian loves to peddle. Do you have any verification of what this person posts here? She maintaines to know the identity of a shop owner, but not those of the aggressors. That’s right, Andy and associated bigots – blame Muslims without any evidence. Why does this website attract so many bigots? “This is evidence of growing anti-Semitism in Sydney, which is not limited to brutal physical assaults allegedly committed by morons. A crude loathing of Jews and Israel is also obvious in protests against the Max Brenner chain of chocolate shops, which is Jewish-owned. Protesters claim that they are motivated only by the chain’s support for the Israeli army, but a vile streak of pure Jew-hate emerges in their online comments. This reached a shocking level earlier this year when the Max Brenner chain announced plans for a store on the University of New South Wales campus. Well, they don`t fit right extremists or neonazis. The outcome will be interesting.